Together with friends. We watched Kung Fu Panda in the cinemas. It is a Holiday on our country and we hardly get the chance to see it because of the long line at the ticket booth. Good thing our friend, Nikki has this connections and we got our ticks. 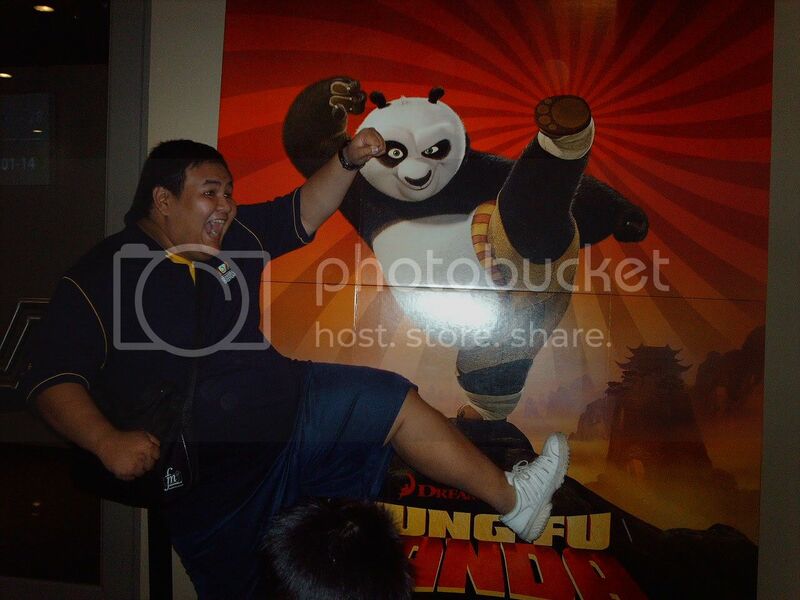 The movie is all about Po (Jack Black), a noodle chef that dreams to be a Kung Fu master. But because of his lazy and fat reputation, Po is almost rejected by Shifu (Dustin Hoffman). But guided by Oogway's (Randall Duk Kim) visions, Shifu whole heartedly trained Po and witnessed what he doesn't expect from a chubby warrior. Kung Fu Panda is a generic "Iam-the-destined-warrior" or "I-am-the-one" type kung fu movie. But despite the predictable nature of the story, the movie didn't fail to give us the laughs and superb Kung Fu moves. With this formula, no wonder why this plain, simple and childish movie beats Chronicles of Narnia: Prince Caspian in Box Office ($60M to $50M respectively). If you want to be entertained then I suggest all of you to watch this movie and experience again Jack Black's humor. I you like to watch an action packed movie, then this is also the movie you are looking for. Forget the story, sit back and enjoy it. I'm giving you the guarantee that you will get out of the cinema laughing out loud.